2 Beds 2 Baths 1,150 Sq. ft.
POINT OF VIEW! Dine 3 times a day overlooking the glistening waters & marina or sip cocktails on your private balcony gazing at sunset & green space! Hop the elevator down to your boat & cruise out to the Gulf, fish or picnic on the many islands. 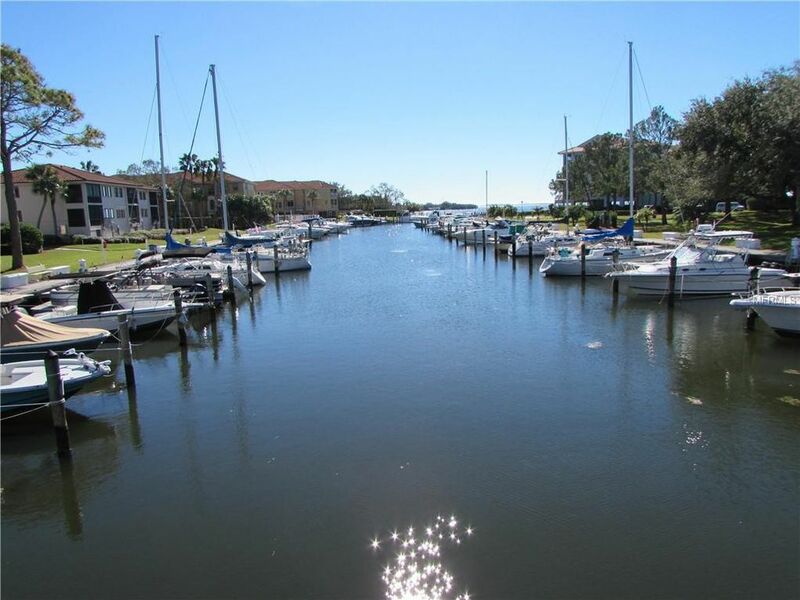 Private community marina has a dredged canal, accommodates sailboats, power boats & cruisers up to 40 ft, docks have power & water & there's even a fishing pier! Boat slips are on a 1st come basis for low monthly fees. Play where you live with resort style amenities - splash in the 2 pools; relax in the spa; compete on the tennis courts; take a Spanish class in the remodeled clubhouse; discover your creativity in the art studio or woodworking shop; shape up in the fitness center; launch your kayak for a paddle; cook your burgers & dogs at the grill & picnic areas; stroll on the nature trail or pedal your bike! This 3rd floor, 2/2 end unit is easy to enjoy! Light & bright interior with new 20x20 ceramic tiles, complete remodeled master bath, all closet interiors upgraded & the bonus of assigned, covered parking! Guard gated complex offers convenience, privacy & security. Beaches, golf, unique shopping, dining, Pinellas trail, Tarpon Springs Sponge docks, entertainment, downtown Tarpon - all in close proximity. This is a winning combination!! Directions: West on Klosterman; Right on Mariner Drive to Guard Gate. Buyers must be accompanied by a licensed Realtor.